From Interstate 26 take exit 49-B to Hendersonville. Travel west on Hwy 64 (Four Seasons Blvd) 1.7 miles past McDonald’s. Travel to the 3rd traffic light (4th Avenue). From this light our office building is at your1-2 o’clock. Free public parking is sometimes scarce. It has a 3-hour limit on Main Street and along the side streets. 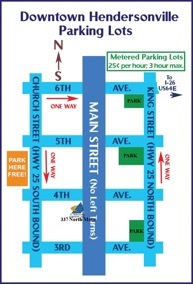 There are 3 metered lots shown on the map below. Our building is light stucco with blue canopies, 337 North Main Street.